Where are all the Muslim Superheroes? Superheroes exist. I have met them. They are a far cry from your spandex-wearing, flying, crime-fighting conflicted characters that exist only on glossy paper. The superheroes I know wear a poly-cotton blend, buy fair-trade shampoo and live ethical lives, fighting their inner demons before attempting to cure incurable diseases. History's first ever superheros were outlined in black, born out of both world wars as an alternative imagination for the youth. Mandrake the Magician, The Phantom and most famously, Superman, were for a short time our gods, our divine heroes. These figures bled into American bookstores during the 1920-30s carrying messages of superpower, hope, defiance and victory. "Take that corrupt civilisation!" they seemed to shout with their painful costumes. With the evolving societies this 'superhero' concept has shape-shifted into chaotic characters, by reflecting back our emptiness and troubles, naivety and experiences. We either want to be superheroes with their abilities to heal or wish we had some of their strength. Interestingly, we are not so different. Take for instance, Superman who was an outsider, an orphaned alien from another planet whose heritage can be traced in the periodic table and crystal caves. I'm certain Superman hails from Muslim land. Little did he know his parents were really Sufi and made a dua` (prayer) before sending him into outerspace. Despite a dual identity (we shall overlook his love affair with Lois as well as those bulging tights), under the alias 'Clark Kent', Superman made his jihad against evils, empowered abandoned women and taught children to share the truth and be courageous! I'm telling you, Superman was Muslim too. His controlled morality scale is the metaphor to a Musim's life. But ask a Muslim to be a hero for you and he will shrug. Translating the Superman/Clark Kent persona into reality would require some awesome turbo power giving element… "Anyone know an ebay store auctioning anti-kryptonite..?" Plus, I doubt if given the chance, a young Muslim man would fly in his underwear. 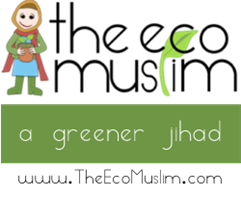 I seriously doubt many Muslims will find hikma (wisdom) or character in a fictitious cartoon that they can implement. 'Well of course not!' shouts the religiosity from Muslims, 'Our heroes are the prophets, sahabah and caliphs!' But how will you take on buried attributes from books which you do not read? Which prophet inspired you to the point of changing your ideals and giving you a purer conscious? When was the last time you saw a man that remotely reminded you of a Musa, Ayoub or sahabi? And why are they heroic when they no longer exist either? Supermen do exist in ways you could not fathom. I know, I help them regularly with sewing capes and reapplying paint to smashed super-mobiles (mostly honda civics). These super human magnificent beings are not prophets nor angels, no, they are in a class of their own. They have descended with light filled auras from another heavenly dimension making a deal with God that in order to teleport back, they would defeat the Shaytan (Devil) with shields of charity and use their superpowers to heal the miskeen (poor) and eradicate zhulm (oppression)! Ironically some of these heroes aren't aware of their own abilities. Like Batman, they live in darkness and need gentle reminders to bring them them back home, especially the broken heroes. Without their return to noble platforms the complete ummah (community) would collapse. We can see the cracks already. I'm telling you, supermen live next door to you, make dua` for you when you didn't ask, hug you in compassion, and like radioactivity, emit pulses of truth that wash over and heal you. 'Where are these Super Muslims?' you ask yourself. Why isn't anyone correcting these injustices? Allow me to shed rationality to the nonsensical fiction you've been reading. You are one of these super heroes. The warrior-scene is changing. Heroes need a revival and I for one am adamant that it’s time for a greater, superior and most average superbeing ever. Meet the old and unsung global hero. SuperMuslims are not popularity driven unlike your attention-seeking Riddler; they do not live in caves or on mountain tops but in flats, terraces, verandas and cottages. Heartbreakingly, SuperMuslims aren't always capable of catching Dr evil or even coming close to exacting revenge to every villain. SuperMuslims will be pushed to their limits yet they push for freedom for others no matter how broken they are. They are always offering support to the ignorant, and like a classically trained sheikh they continue to teach nobility, to give sufferers their happiness first, putting the stranger, 'the other' before themselves even if 'the other' is wrong. Like Spiderman’s battle with Venom SuperMuslims too go through identity crises: which whispering voice does he follow when wearing a two-faced mask? Even when outnumbered SuperMuslims stand on crumbling foundations and face their rivals head on, with factual reasoning, dignity and tolerant understanding of the lesser heroes. SuperMuslims are stronger heroes when they lean on sidekicks, their pillars of strength that act as a body where if one part aches, the rest feels the pain and strives to heal it. SuperMuslims more often work as masked individuals and never reveal their true identities out of humility. And 'who are they?' you've finally squealed. 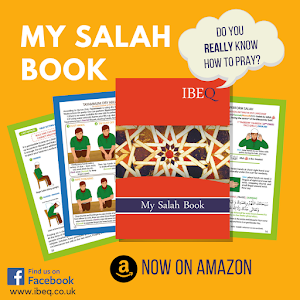 When you've finished reading this you'll see the SuperMuslimness in the first Muslim you meet. Your mother is a Superhero from enshrouding her children in invisibility cloaks to protect them from unseen evils. Our heroic fathers are on missions 24 hours a day attempting to impart wisdom, and splitting seas of anger like Hulk to lead calm paths for the future. Elasticated little brothers are superheroes, fast and entertaining, in their eyes are sparks and magic, reminding older generations of lost innocence. 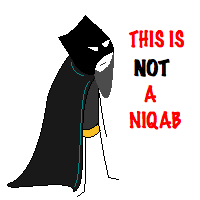 The SuperMuslim is not gender biased either: enigmatic girls that outrank catwoman live in colourful kodak moments. Their superhero powers could make evil high school bullies explode. I know. I saw one once. It went *kaboom*. It does not end there, so I go on. There is a hero in an honest Muslim lawyer who uses legislation to free people from accusation. And those criminals who have been tarnished must be requited, given their life and heroic stature back to live again and build Muslim lives. Lost heroes yearn for a second chance to conquer past losses, regrets and the darkest fears. SuperMuslim teachers are heroes in their daily educating of miscreants, abiding by fierce inequality, authority problems, rebellion, discrimination... and the students are equally torturous. This SuperMuslim ideal isn't that hard to swallow. Sure I accept that those with power and priviliege may become heroes more easily. But what is stopping you? In which holy scripture was divine action limited to only The Divine? Altering the world is a burden, an elephant task. I am in no way or form asking you to fix the wars, bring people back to life, give your life savings to eliminate poverty or find the answer to every quantum physics question. That is impossible. I know, I studied quantum physics. I am asking you as I would ask my friendly local superhero. I am telling you in honesty hat YOU can make the greatest impact of all by being the best SuperMuslim you can be. And that too is the greatest heroic quality existing. You cannot learn super abilities overnight. When you ask for help people will expose and violate you, rip your Superhero identity to shreds; a devilish political reaction. You need to stand tall despite the fall and base your strengths on your unshakable faith. Do not say 'I cannot' for I am telling you 'You aleady are'. Make things happen by taking small planned steps before whooshing off into the ebony skies. Before I vanish in my glittery headscarf and cape I must remind you once again. 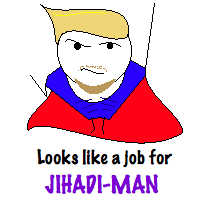 We need you to find the SuperMuslim in you. I need you to. You need you to. Use the prophets and any other Musilm hero you have read about to dive deeper and if that is too difficult, use a hero you have met. Do not be fearful in your aims or ideas. If they begin from sincere brave intentions, they will bloom to conquering change. In your average, disappointing, despressing and difficult life, there is a SuperMuslim raging with Goodness, a genius. Do what you can do, Allah will never throw missions that are beyond your ability. Should the straight and narrow seem far-fetched, you could always apply for the SidekickMuslim job, there is no humiliation in that. 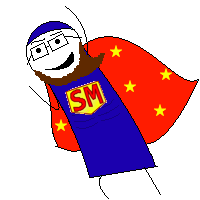 In fact, I'm a sidekick to many SuperMuslims. The SuperMuslim is in us all. I know it is. I’ve seen it. In your own small and precious way, it exists. There are glints hidden deep in our souls that need reigniting. I am giving you your spark fellow SuperMuslim, now go alight the world. Published May 2009 on www.muslimsinengland.com.